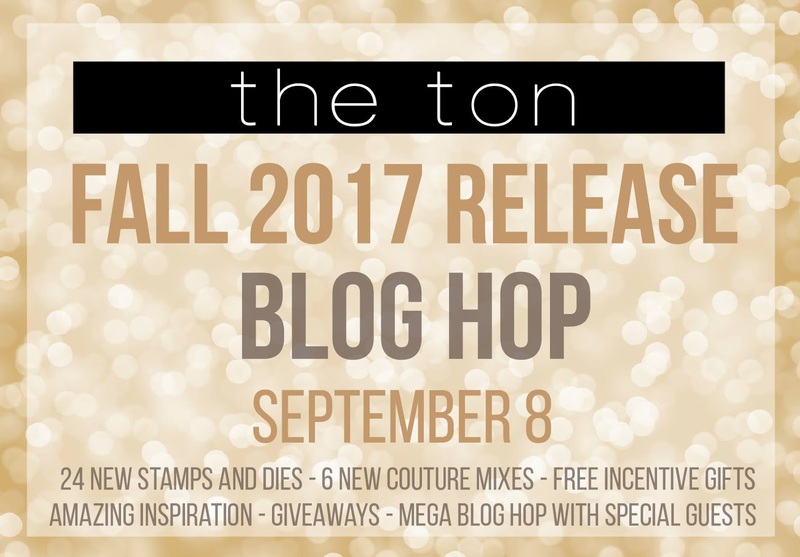 Hello and Welcome to The Ton's Fall 2017 Release Blog Hop! If you arrived here from amazingly talented Amy Kolling, you are right on track! 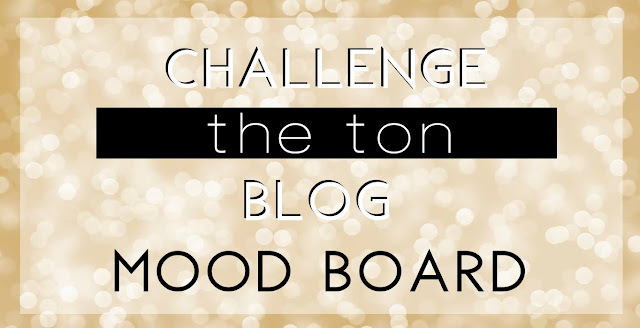 If you want to start from the first stop please hop over to The Ton blog! We revealed during our Release week 21 clear stamps, 3 rubber cling stamps, coordinating dies and 6 Couture Mixes which includes up to three gifts with purchases. For today's blog hop I've created two cards. 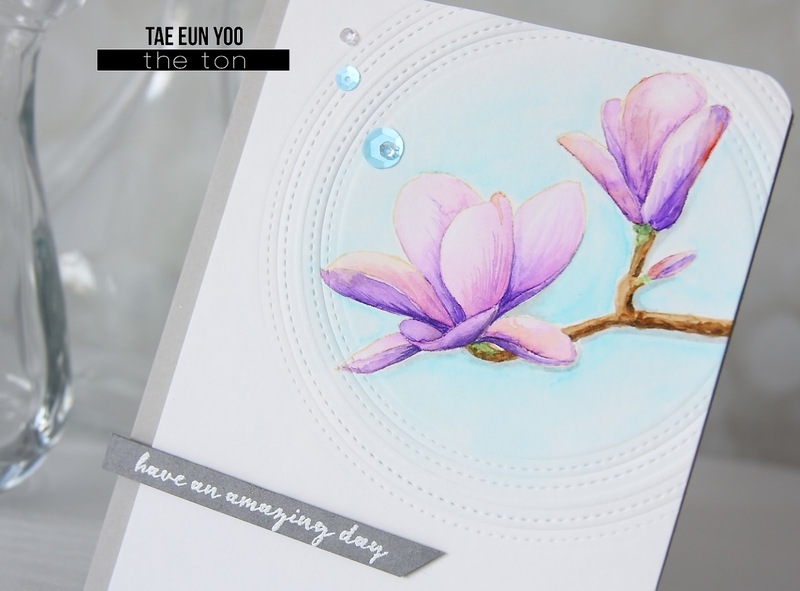 The first card is featuring gorgeous Magnificent Magnolias in CAS style. I stamped the magnolia image in Antique Linen DI on some watercolor paper and colored it using Zig brush markers. I added the light blue background in a circle shape and dry embossed two Double Stitched Circle dies around it. I foam mounted the panel on a light gray cardbase as shown in the picture. The sentiment is from Magnificent Magnolias as well. I white heat embossed it on a strip of dark gray cardstock and foam mounted it onto the card. To finish off I rounded one corner and added a few sequins from Blue Ice. Next I've made a holiday card using Large Florals: Carnation. 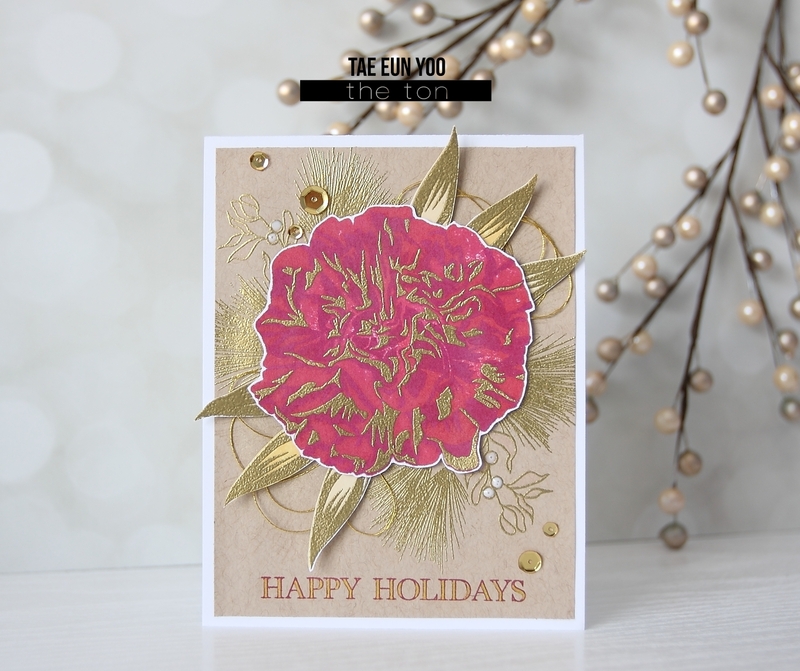 I stamped the first and the second layer of the carnation in Lipstick Red and Pink Derby and gold heat embossed the third layer. The leaves were stamped in Vanilla Frosted Cupcake and Beach Blondie before gold heat embossing. I fussy cut them all (you can use coordinating dies!) and started to create the background. I gold heat embossed the pine leaves and mistletoe from Holiday Cones Outlines on a kraft panel. Some of the stamped images in embossing ink were colored with Biscotti Perfect Pearls. There are subtle shimmer but it's very hard to capture in the picture. To assemble my card I glued the kraft panel on a white cardbase, made a nest using gold thread and foam mounted the leaves and the carnation on it. The sentiment is from Holiday Movie Sentiment Mini set. I stamped it in Lipstick Red and filled the letters using a gold gel pen. To finish off I added some gold sequins and white Pico embellisher on the berries. The Ton's September Challenge is now live! 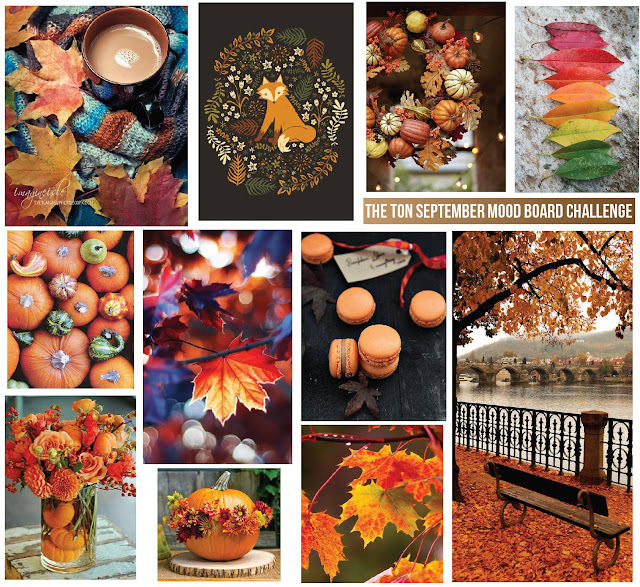 For this month, we have a fun Mood Board Challenge, so head over there now for a chance to win a $50 spree to The Ton’s shop! Next on the hop is our amazing guest Laurel Beard!!! Below is the complete blog hop list. Using dies to emboss is so clever. Awesome card design, love the magnolia one best, after seeing all the new stamps! Love your card designs are so lovely. I can't seem to get enough of the magnolia stamp. Another fabulous release by The Ton. Your coloring on the magnolia card is perfect! Love it! Wow, love how your colored/painted the Magnificent Magnolias. Can't wait to see how this hop turns out. Both are beautiful but the Magnolia is gorgeous! Very pretty ... thanks for sharing. Gorgeous cards, the gold embossing is simply stunning! I love how you showcased the magnolias with the stitched circle dies. And using the carnation as a Christmas card is inventive and works. that gold embossed carnation is stunning. Both beautiful cards, but especially the gorgeous magnolia card. The magnolia stamp is so realistic. Your watercoloring is inspirational. Thank you for sharing. Wow!! Your cards are stunning!! Love the magnolia card. Very elegant. My favorite is the carnation Christmas card. Love how you've used the carnation. The gold embossing looks so pretty. Beautiful cards. Love the red and gold. I love the magnolia card. Your coloring is beautiful. The gray sentiment is the perfect color to compliment the soft color of the magnolias. Beautiful magnolia card - wonderful coloring! Beautiful cards, I love the magnolias. Your cards are beautiful as usual. I love the coloring of the magnolia, it's just a lovely stamp. Lovely, lovely cards. The top one reminds me of a painting I gave my Mom for her birthday years ago - so beautiful. Oh my goodness!! You've made two amazing cards !! The first one is so delicate that the flower looks real. And the second is sooo rich that it's perfect for holidays! Congratulations! LOVE your ELEGANT magnolias, ADORE the pop of gold on your VIBRANT carnation! I love the soft coloring on the magnolias and the combination of the gold, red and kraft is really stunning! Really beautiful cards! Oh my!!! Awesome cards!!! All your cards are pieces of art!!! The magnolias are looking like a dream . Awesome cards. Another set of beautiful cards! I love everything you create! Love the shading on the magnolias. So beautiful! Love the circle stitching on the first and well... gold... yum! Two beautiful cars. 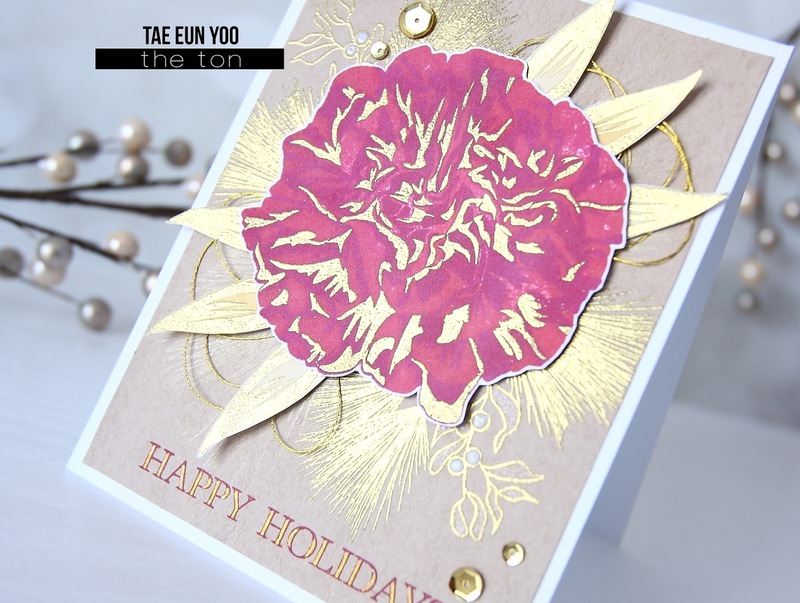 I love the bold pink and gold with the carnation which contrasts with the light subtle colouring of the amazing day card. Great versatility. Thanks for sharing. Your cards are amazing! Love the coloring and the gold embossing. Your cards are beautiful. 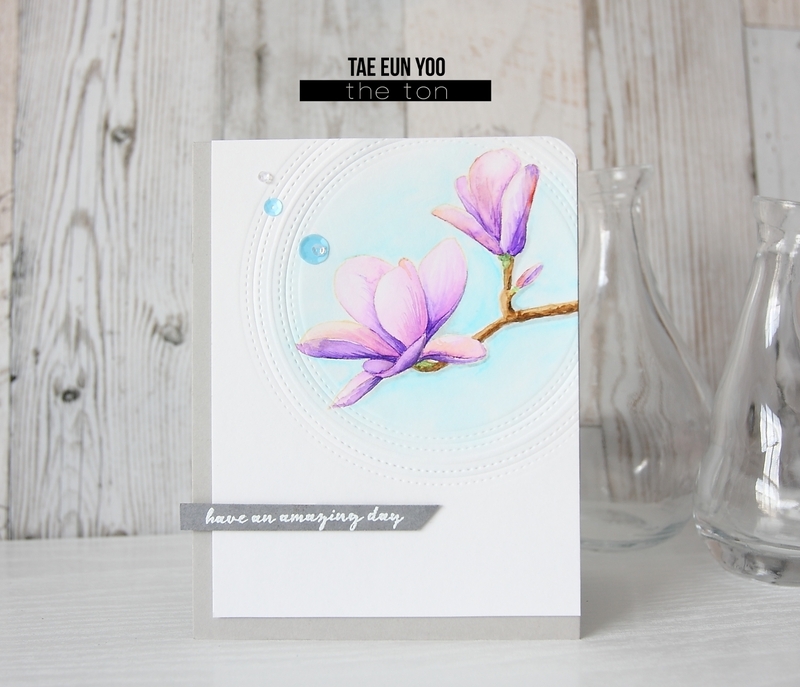 I really like how you framed the magnolia on your first card, such wonderful coloring too. Wow, wow, wowwwwwew!! I love your gorgeous cards! Simply GORGEOUS designs TaeEun!!! Love the new florals!! your designs showcase them in a spectacular manner! Thanks for the inspiration! Have a wonderful day! That softly colored magnolia is beautiful! I love how you framed your beautiful magnolia with the embossed frames. It is just gorgeous! I also love how you embossed your carnation in gold. It is stunning! Beautiful cards! Love the way you colored the magnolias! Great cards! The magnolias are stunning! Great cards, but LOVE the magnolia card, it is stunning! Love how you used gold embossing on your cards. Very lovely cards! The magnolia is to die for!!! Beautiful cards. Love your magnolias card. Wow! Awesome cards. You're rocking these lovely stamps! Your 2 cards are amazing TaeEun! I love the details of the double stitched circle dies behind your gorgeously coloured magnolias and the gold string behind those magnificent gold carnation and leaves! Thanks for the inspiration.